How we love delusions. It is our bread and butter, out sustenance, it is what keeps us going. Some openly admit it. Yes, they live in a fantasy world, but it is much nicer than reality. Yes, I recall such a movie where a man did all he could to be admitted to a mental asylum. He had come to the conclusion that indeed it would be a much happier life. Who needs reality? Fantasy is so much better. I am currently reading yet another Holocaust book, another book on the Warsaw Ghetto, a place that I had the privilege of visiting with my dear friend, IKI Instructor Tomasz Adamus. The experience was so powerful that I know I must return. I stood where the great ones stood. I stood where they fought and died. I stood with my heroes, heroes of our nation. Part of their greatness was that they refused to accept delusions. Others had said, surely the Germans would not kill us all, they need us! Others said, surely the outside world was currently working on a great plan to save us. Some said that soon England would grant all remaining residents of the ghetto English citizenship. Others "heard" that America was arranging a population exchange; German residents in the USA for the Jews of the Warsaw Ghetto. And yet others were waiting for the Polish Resistance movement to come save them. But our heroes said no. Do not fool yourselves, help is coming from no where! We have no one to rely on but ourselves. And so the Jewish Resistance movement was born. Moshe inside the ghetto. 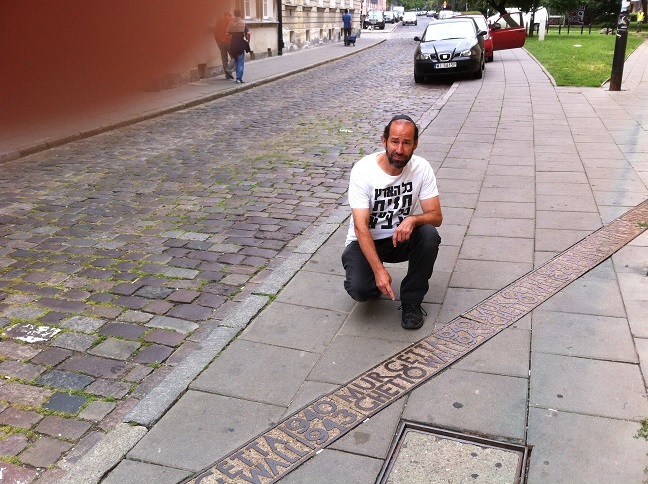 The ghetto was destroyed in 1943 but the Polish government has honored its memory by marking the outlines of where it was. In the Days of Darkness it would be nearly impossible to cross this line that I am pointing at. One side meant death while the other side meant possible life. At its height half a million Jews lived in the ghetto. Nearly all of them were murdered; men, women, children, great rabbis and philosophers, musicians and composers, authors and scientists, all wiped out. Today we are facing difficult times, both here in Israel and all over the world. But most choose to live in the Fantasy world, after all it is so much more pleasant. We have world class Krav Maga instructors who have only a handful of students showing up for class. We have lawyers fighting for the "rights" of murderers and thieves. We have homes that are not properly protected against the crime that will surely come. And we repeat like a mantra, help will come from ...some place else. I need not take any action, help will come. My heroes became heroes the moment they refused to believe the lies, the hype, the illusions and the delusions. The year is 1942, most of the Jews of Poland have already been killed. The Warsaw Ghetto is down to less than 10% of its peak population. And still the Jews continue to believe, to delude themselves. Reality cannot shatter the fantasy. They find "proof". Yesterday there was no "Aktion", no forced roundup of Jews for deportation to Treblinka, and today again there was no Aktion. So you see, the Germans have decided to spare the remaining Jews. And then our heroes, Pavel Frankl and Mordecai Anielewicz, stand up and say NO. Do not believe the lies, do not allow yourselves to be deluded. Both men died in action against the Germans. Today we say the same. How many murders will it take? How many shootings, stabbings, and rapes will it take until you stop believing your own delusions? The Talmud says the fool is not to be pitied. His own doing will get him in trouble. You cannot stop him. Mr T. says "I pity the fool!" It is up to you to be the fool or be the hero. Immerse yourself in Krav Maga training and Israeli culture for two weeks. Two weeks that will change your life. See your self defense skills improve from day to day. Sessions every March, June and November.